← “Heart of Davie” open house for Davie & Bute plaza concept – June 6 (Sat). Public input opportunity. (Updated 16-June-2015. After our web post on June 8, an official development application notice went up on the site, and further details have come out. Some tenants have already received notice that they will be evicted and the buildings demolished.) 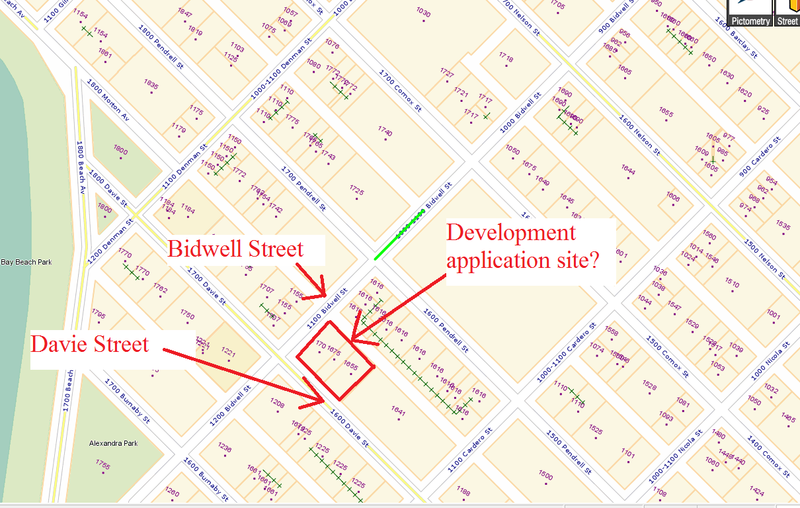 According to the schedule for the City of Vancouver’s Development Permit Board (DPB), a 22-storey tower is being proposed for 1188 Bidwell (at the corner of Davie and Bidwell). The application is listed on the DPB schedule for September 8, 2015. 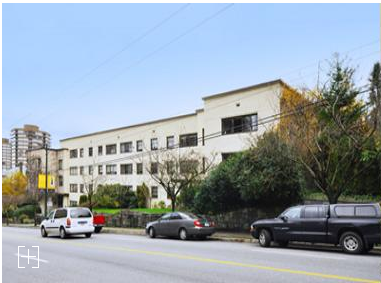 An open house sponsored by Reliance Holdings is set for 5 to 8 pm on Monday, June 29, 2015, at the Empire Landmark Hotel (1400 Robson Street) with Reliance and City staff available to answer questions and receive comments. Description: The development of a 22-storey mixed use building comprising 108 “secured market rental” dwelling units, and three commercial retail units at grade, all over 4 levels of underground parking, accessed off the lane. It is WEN’s understanding that there will be no public hearing for this application and no review by City Council. Why not? Many people may be surprised, but this entire section of the West End was rezoned by City Council in January 2014 to accommodate tower development as part of the implementation of the West End Community Plan, which was adopted by Council in November 2013. All that remains for public input is likely to be a questionnaire at the open house (June 29) and an opportunity to write and/or speak to the DPB in September. Since this project appears to be under the Rental 100 developer incentive program, there will likely be no Community Amenity Contributions (CACs) paid to the City to contribute to improvements in the West End. As well, it is likely that there will be no Development Cost Levies (DCLs) charged to help offset the increased burden on City infrastructure. WEN notes that these shops are currently on the site at the north-east corner of Bidwell and Davie: Mac’s, Enchante Hair Salon, Bosley’s Pet Foods, and Vivien’s Fashions. expect that is is proposed to be demolished if this project is approved. Below are more comments on this application DE419087. You may wish to share your observations with elected officials (Mayor and Council) or seek clarifications with the West End Planning Team (westendplan@vancouver.ca). First, West Enders should take note that this application’s physical features (height density, etc.) as well as its approval process are a direct outcome of the West End Community Plan process, which ended in 2013. This project is a sign of things to come. Second, residents may notice the short turn-around time on this application. The project information was not posted on the City’s Development Applications web page on June 8, 2015, when we first became aware of the application. (The only way someone would have known about the project would be if you happened to be browsing the DPB agenda for September.) Will the City give affected residents fair and adequate time to review the application and prepare their comments to the City? Third, the City needs to provide adequate notification to renters in the area–not just to property owners. The City has a track record of failing to properly notify renters affected by projects. For reference, see the most recent case: “City Hall’s failure to notify many residents (renters) of new development projects – case in point 1177 (1171) Jervis Street” (WEN website, 5-May-2015). Will City officials do better this time, and contact the thousands of renters living in the affected area? Fifth, Reliance Properties has a close relationship with the Jim Pattison Group. One major joint project of the two companies is the huge 54-storey Burrard Place tower complex slated for construction on Burrard Street. For example: http://www.buzzbuzzhome.com/burrard-place and here and here.